Our family has this annual tradition of watching Metro Manila Film Festival movies on Christmas Day but we have decided to skip that practice this year, or maybe, we would just watch the entries on the latter part of the festival when there are only few people at the multiplexes, hopefully. On Tuesday, when we arrived at a nearby cinema in Fairview, there was a long queue at the tills. We moved to an adjacent mall and the situation was the same – the earliest screening for Fantastica and Jack Em Popoy (the only films suitable for the children in our group) was 8:00 p.m. (we were there before 11:00 a.m.). So, we decided to do something else instead. Browsing social media gave me a clearer picture of what the MMFF has become this year. Most films are sold out and there are moviegoers who are willing to wait in line for hours just to see the two films, which are predicted to be this year’s top-grossers. In fact, Fantastica starring Vice Ganda and Jack Em Popoy starring Coco Martin, Maine Mendoza, and Vic Sotto have been leading the MMFF 2018 box office. “As expected, ‘yung mga pelikula ni Vice Ganda at saka ni Coco Martin at Vic Sotto ang nangunguna sa takilya,” MMFF spokesperson Noel Ferrer said Wednesday adding Anne Curtis' Aurora is far third in the box office ranking. In the 2017 edition of Metro Manila Film Festival, the total box office gross for all eight entries surpassed the P1 billion-mark. 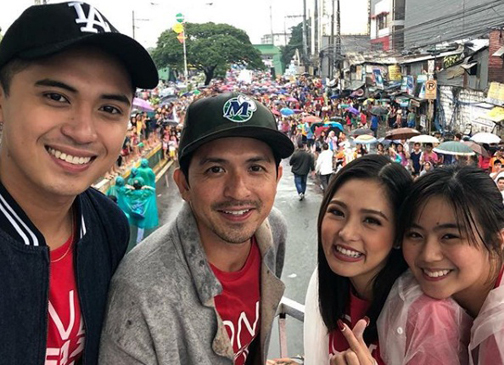 It prompted the MMFF executive committee to extend the screening of MMFF films in select cinemas beyond the usual festival period which ends first week of January. For this year, the annual filmfest aims to replicate the same success. "We're really targeting to achieve the P1 billion [gross revenue] this year," Noel Ferrer told DZMM in an interview. "But of course we would understand kung hindi man, kasi naintindihan natin 'yong context naman ng pamumuhay ng mga tao kasi mas mahal 'yong sine ngayon compared to last year," he added. I wasn’t against that major change. In reality, it gave a chance to other film producers and outfits to showcase their genre films in a festival usually dominated by romcoms, comedy, and horror. And I’m all for that kind of exposure as it gives film workers more opportunity. But then again, the Christmas season is not the part of the year where most cinemagoers would want to watch films that challenge their critical thinking. Don't get me wrong, we have intelligent moviegoers, but they also need some sort of a breaker once in a while. And this is the perfect season for that – the time when people just want to have a good laugh and enjoy the cinema experience with the people dear to them. We can reserve art films, the more intelligent movies for a different venue, like the Cinemalaya and the Pista ng Pelikulang Pilipino. 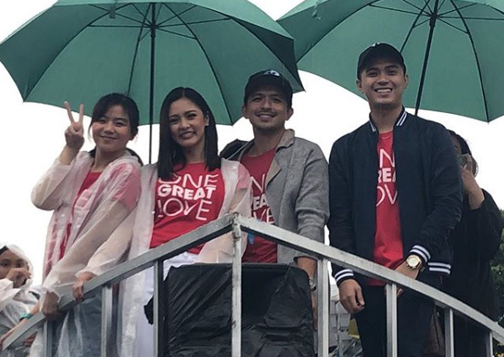 The stars of Regal Entertainment's MMFF entry 'One Great Love,' Marlo Mortel, Dennis Trillo, Kim Chiu and Miles Ocampo. This year’s lineup isn’t bad at all, and there are a few surprises that made us trust mainstream film outfits once again. So, that P1 billion is achievable. The festival might even surpassed that basing how people received the movies on its first day.